India's Prime Minister Narendra Modi has launched a 16bn rupee scheme ($2.5bn; £1.8bn) to electrify all households by December 2018. It will cover more than 40 million families in rural and urban India - roughly a quarter of the population. The "Saubhagya scheme" will largely be funded by the federal government. The government also aims to provide free electricity to poor families identified by them based on socio-economic data. What does India's ratification of the Paris climate deal mean? It will bring "a monumental change in the lives of the poor", the PTI news agency quoted Mr Modi as saying on Monday. About 300 million of India's 1.3 billion people are still not connected to the electricity distribution grid. Although the households to be covered are spread across the country, the scheme primarily targets rural India where electrification rates are much lower. 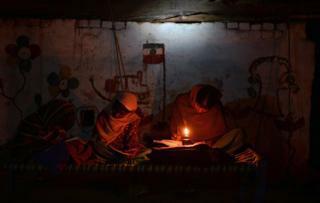 Millions of rural Indians still rely on lamps fuelled by kerosene, the use of which the scheme hopes to cut. Kerosene is a huge health and environmental hazard and restricting its use would further India's ambitious climate goal to cut emissions. The federal government launched an electrification programme in July 2015, under which thousands of villages were connected to the grid. But unlike the earlier scheme, the Saubhagya initiative targets individual households rather than villages. This is because a village is declared as electrified if 10% of households, schools, health centres and government offices have access to electricity. Experts have said such a scheme will also expand the consumer base of state-owned power distribution companies that are struggling with debt and poor demand. The idea is that these companies will now have to supply power to newly electrified households.